The availability of numerical guidance from NWP models has been an important component of operational forecasting for decades. For many, the output from this numerical guidance was produced by a mysterious “black box”. Rules for using and adjusting the guidance for operational forecasters were often subjective “Rules of Thumb” based on experience rather than based on quantitative analysis. To open up this “black box”, we produced this web-based “Operational Models Encyclopedia” linking both generic information on how NWP models work, and specifics on physical parameterizations, dynamics, and data assimilation in operational models. Ensemble Prediction systems and Marine Wave models are included as well. Content is updated as operational models upgrades are implemented or new models are added to the operational NWP suite. While the time estimated for completion is listed as 2-3 hours, that only applies to reviewing the full resource. Actual time spent should be much less, depending on the model component being researched. Provide operational forecasters with a single source of information on the dynamics, physical parameterizations, and other characteristics in operational numerical weather prediction (NWP) models, ensemble forecast systems (EFS), and regional and global wave models. Provide updated content when NWP, EFS, and wave models are updated. 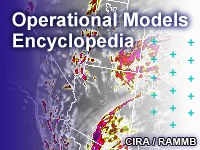 Provide links to lessons describing how updates to NWP, EFS, and wave models impact their use in the operational forecast process. The Global Forecast System (GFS) entry was updated. An entry was added for the first high resolution ensemble forecast system (HREF). An entry for the Real-Time Mesoscale Analysis/UnRestricted Mesoscale Analysis (RTMA/URMA) was added to reflect updates to the inner workings of the analysis used to bias correct and weight the elements of the National Blend of Models (NBM). The RAP/HRRR was revised to include updates to the WRF dynamical core v3.6, an increase in forecast hours for the RAP and HRRR, and other updates. Direct links to Meteorological Services of Canada (MSC) global and regional model descriptions are now included and will be periodically updated by MSC. The North American Mesoscale (NAM) version 4 was implemented on 15 March 2017 and changes have been documented in the Encyclopedia entry, including discontinuation of Downscaled GFS by NAM Extension (DGEX) model output, removal of legacy products from NAM on NOAAPORT and NCEP/NWS servers, reduction of grid spacing, removal of convective parameterization, and other improvements. An update to the Global Forecast System (GFS) was implemented in June 2017, and information added to Encyclopedia includes assimilation improvements, new soil and land use and other data sets, new SSTs, upgrades to convective parameterization to improve summer precipitation forecasts, and other improvements. An update to the RTMA/URMA to version 2.6 was done in November 2017. Entry updates include information about a Rapid Update RTMA (15-minute cycle), hourly precipitation URMA for the Continental U.S. (CONUS) and Puerto Rico (PR), and a new terrain and land/sea mask in use for CONUS/PR/Hawaii (HI) as well as the addition of several new weather elements. Also in November 2017, the high resolution ensemble forecast system (HREF) was updated to version 2.0, making this ensemble system more similar to the Storm Prediction Center’s Storm-Scale Ensemble of Opportunity (SSEO). Entry updates included addition of the National Severe Storm Laboratory (NSSL) WRF to the ensemble system and shortening the time lag of the ensemble membership from 24 to 18 hours. Please contact Bill.Bua@noaa.gov if you have any questions or need further information.